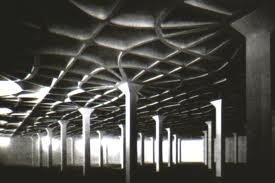 One of the most iconic images of Nervi’s work is the underside of the floor slab at the Gatti Wool Factory. Nervi laid out it’s concrete ribs along isostatic lines, which put the greatest bending resistance at the point of maximum moment while visually expressing the flow of forces through the slab and toward the column. It’s a great moment in his work, and the picture graces all kinds of history textbooks. But it’s the only image I had ever seen of the factory. And none of my Nervi contacts in the U.S. or Italy knew where it was, or even whether it was still extant. So this one involved a bit of detective work. There were references online to a commercial redevelopment in the 1990s, and one news article that described it being on the Via Prenestina. That was some help, but that’s a long, long street, one that follows an old Roman road way out into the world. The Nervi Archives had interior images of an upper floor–the space above the slab—which was covered by what were obviously north-facing skylights in a pretty standard (though of course elegantly detailed) configuration. Still, no exterior shots, or plans. I was able to find just a handful of structures on Google Earth that fit what the interior pictures showed, and I guessed that it was a building that was listed as now being a shopping center. That fit the news item I’d seen, so I hitched a ride (with someone who, for reasons that will soon be apparent, probably doesn’t want to be associated with this whole escapade) and we drove out to see it. It wasn’t promising, and it looked a little late for the Gatti’s 1953 date. And, it was chinos. Big fence, and a gate that wasn’t just locked. It was welded shut. I am firmly of the opinion that seeing a building that the owner wants you to see is tourism. For it to count as research, you probably need to jump at least a fence or two. Which I did, and I got just to the front door before two security guards–one of them wielding a knife–caught up with me. They had keys, which looked promising, until even my rusty Italian figured out that their very generous offer was not to let me in the building, but rather to let me out the front gate so I wouldn’t have to vault the fence back again. My colleague used some far better Italian to explain what I was up to, and after apologizing for the knife (they were eating lunch, it was a cheese knife, but it still would have hurt) they let me take a peek. And once inside it was obvious that I had the wrong building anyway. North-facing skylights, 1950s concrete, exposed end girders. 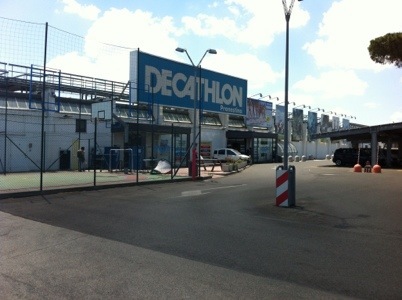 And, best of all, it’s a sporting goods store, so no fence to jump. 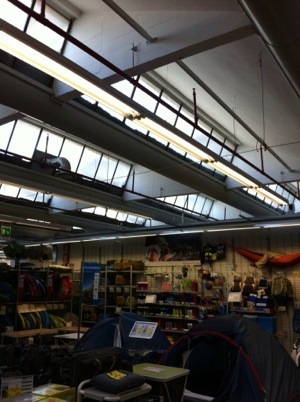 So this is the top level, and it’s a pretty bog-standard concrete factory roof with light monitors–not terribly impressive even if you mentally take out the tents and the running shoes. But it is immaculately detailed, and there was clearly some attention paid to making the ceiling read as a continuous, hovering plane of light. Simple, but thoughtful. One of the staff confirmed that it was the old Gatti factory after I showed him the classic picture. And where are the stairs down to the storage room? The one with the great ceiling? Ah. The store only rents the upper floor. Downstairs? The auto dealership next door uses it to store their luxury cars. Big fence on the ramp. Padlocked doors. And the dealership had closed for the afternoon. So I have a call into them with a rather unusual request, and we’ll see if there’s an episode II of this one next week. I’ve jumped enough fences for one day, and I suspect that the dude guarding the Lancias has more than a cheese knife in his arsenal. You are currently reading Lanificio Gatti, episode I at architecturefarm.